I’m glad you enjoyed this so much. Your review almost exactly describes my own feelings the first time I read it – I missed the characters from the first book too and I was frustrated that, after catching a glimpse of what I thought must be the real Lymond at the end of The Game of Kings, he spends most of this book playing yet another different role. By the time I reached the end of the series, I had a better understanding of how this one fits in and how it forms an important part of the story. This one sounds interesting to me and as I have never read the Game of Kings, I hope I won’t be disappointed in comparing it. 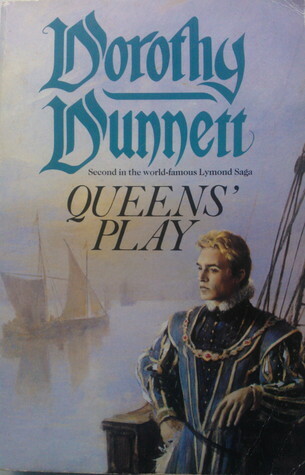 At one stage, I planned to read the entire Lymond sequence, but after enjoying A Game of Kings so much, I found I could hardly get started with Queen’s Play – and there I stuck. One day… perhaps! Oh I really must get around to The Game of Kings – perhaps a good holiday read? Especially as this second book looks great too! My mother read this one first (she actually began reading it the day I started nursery school). She didn’t even realize it was a sequel initially but as she was already a 16th century fan she was immediately won over. I can see it would change your attitude toward Lymond to already know him as a diplomat (of sorts). By the time I was in high school and started the series myself I had already absorbed a lot about Lymond from her and her friends . . . I can see that this one would stand up on its own, and I suspect I shall love and want to re-read all of the books once I’ve seen the bigger picture. How recently was it that you read A Game of Kings? I have the feeling that this is a series one should read in relatively quick succession?